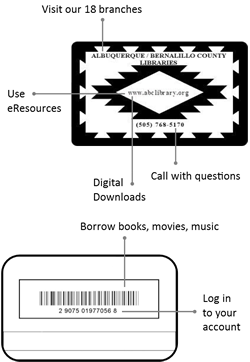 Welcome to the ABQ-BernCo Library! Your card can do a lot for you. Search our FAQ page or submit questions via AskUs! Or call your local branch. We host a wealth of programs for children, adults and teens. You can even “Read to the Dogs”! Do you need a place to meet? Book one of our rooms for your group. Library staff is here to help. More than 1.2 million all for you! We have what you want to read, from the latest best sellers, to children’s books, to graphic novels, to how-to manuals, and beyond. We have books in Spanish, Vietnamese, Chinese, Arabic, French, German, Italian and Russian, to name just a few. Live online homework help from Brainfuse HelpNow every day from 2 p.m. – 11 p.m.